4 | TH E M R EP O RT TIM ANDERSON Director of eServices at DocMagic Tim Anderson brings over 30 years of industry experience having worked on both the lender and vendor side of the business. He has held executive management positions with LPS, Stewart, Fidelity, FreddieMac and HomeSide Lending where he ran the eCommerce Division and worked at technology companies like Dexma, Microsoft and Tuttle Information Services. KATHY CUMMINGS SVP of Homeownership Solutions and Affordable Housing Programs at Bank of America At Bank of America Home Loans Neighborhood Lending, Kathy Cummings is responsible for managing nonprofit strategic relation- ships and the bank's Connect to Own fee-for-service program offering. Joining the bank in 2003, Cummings has served as Technology Service Delivery Manager and as National Pricing Manager, but began her current role in 2008. MAUREEN DAVENPORT SVP and Chief Communications Officer at Fannie Mae Maureen Davenport leads communica- tions, marketing, and community investment and engagement. Her responsibili- ties include internal and external communications; leading the corporation's digital strategy, including oversight of all Fannie Mae's social media and web properties; marketing in support of the company's single-family, multifamily, capital markets, and credit loss management businesses; corporate giving; and employee engagement and volunteer efforts. DAVID GANSBERG President and CEO at Arch Mortgage Insurance Company David Gansberg serves as President and CEO of Arch Capital Group, Ltd.'s (ACGL) U.S. mortgage insurance op- eration (Arch MI). Gansberg has held this position since Arch MI was launched in January 2014, following ACGL's acquisition of CMG MI and certain assets of PMI Mortgage Insurance. Gansberg was active in the acquisition and led the effort to obtain Fannie Mae and Freddie Mac mortgage insurer eligibility. SHARON MCHALE VP of Corporate Communications & Marketing at Freddie Mac Sharon McHale directs Freddie Mac's public relations and brand manage- ment; internal communications; market re- search; product positioning; sales support; customer communica- tions, marketing, and outreach; and creative services. She's also responsible for Freddie Mac's online presence, including its social media strategy; web con- tent development, design, and management; site architecture and navigation; usability testing; and usage metrics. MARION MCDOUGALL EVP of Operations at Caliber Home Loans, Inc. As EVP of Operations at Caliber Home Loans, Inc., Marion McDougall's responsibilities encompass all servicing functions, including performing servicing, default ser- vicing, investor reporting, asset performance, and sales and ac- quisitions. She also oversees post closing, policies and procedures, training, and human resources. Prior to joining Caliber, McDougall served as COO at MetLife Bank, N.A., for four years. DAVID SCHROEDER VP of Claims at Mortgage Guaranty Insurance Corporation David Schroeder has worked at Mortgage Guaranty Insurance Corporation since 2000 and currently holds the position of a VP in the Claims Department. In this role, he is responsible for a variety of operational areas within the company, including quality assurance, operational report- ing, and operational analysis. As such, he provides strategic direction and leadership within the department. LANDON SMITH SVP of Title and Closing Services at Stewart Title Landon Smith, Group SVP of Enterprise Lender Title Solutions at Stewart Title, is responsible for the national title and closing product strategy for origination title, default title, and REO title/closing services. Smith oversees Stewart's title and clos- ing relationships with enterprise lenders, servicers, government- sponsored entities, and Stewart's network of offices and agents. KEVIN WALL President at First American Mortgage Solutions Kevin Wall is responsible for strengthening the company's alignment with lenders, servicers and investors, and strategically positioning the company to offer innovative, data-driven solutions focused on providing accuracy and transpar- ency throughout the mortgage loan lifecycle. He previously, gained deep industry knowledge through his decades of service at First American, CoreLogic, Wells Fargo Financial, Centex Home Equity, Morgan Stanley, and other companies. 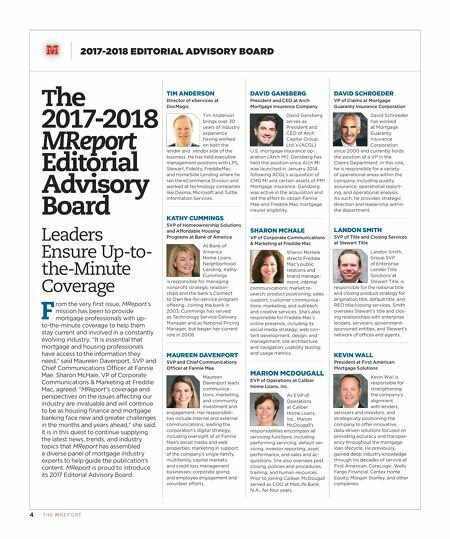 2017-2018 EDITORIAL ADVISORY BOARD The 2017-2018 MReport Editorial Advisory Board Leaders Ensure Up-to- the-Minute Coverage F rom the very first issue, MReport's mission has been to provide mortgage professionals with up- to-the-minute coverage to help them stay current and involved in a constantly evolving industry. 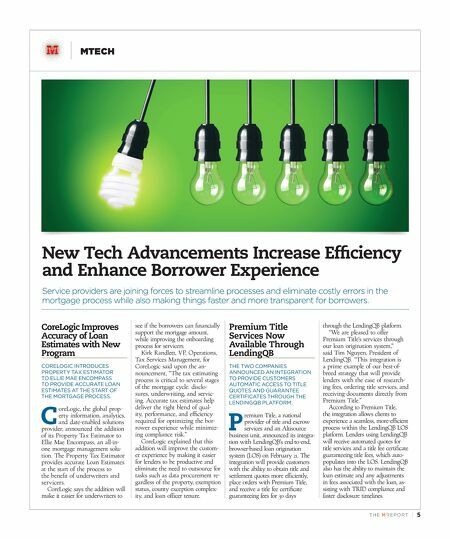 "It is essential that mortgage and housing professionals have access to the information they need," said Maureen Davenport, SVP and Chief Communications Officer at Fannie Mae. Sharon McHale, VP of Corporate Communications & Marketing at Freddie Mac, agreed. "MReport's coverage and perspectives on the issues affecting our industry are invaluable and will continue to be as housing finance and mortgage banking face new and greater challenges in the months and years ahead," she said. It is in this quest to continue supplying the latest news, trends, and industry topics that MReport has assembled a diverse panel of mortgage industry experts to help guide the publication's content. MReport is proud to introduce its 2017 Editorial Advisory Board.